Road Commission employees participated in the Annual Snowplow Roadeo on October 11th. 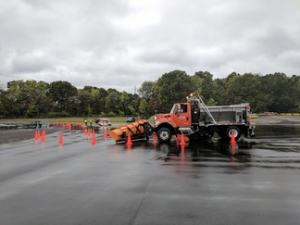 The event is hosted by the Mid-Michigan Chapter of the American Public Works Association and representatives from Road Commissions, MDOT, and Public Works Departments from around the state participated. The event included contests for “Pride of the Fleet”, “Innovative Ideas”, and a snowplow driving course. The Roadeo also provided seminars on best practices for supervisors and drivers, as well as presentations from leaders in the industry on current trends and innovations for tackling the snow season. The event is a great way for public organizations to collaborate, compete, and learn from each other in preparation for winter. 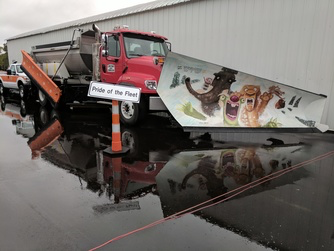 It is one of the many ways in which the OCRC prepares for the snowplowing season.The snowplow truck, with fabrications from Road Commission staff, and the plow blade painted by local high school students won Pride of the Fleet. The Innovative Idea was an invention that helps make loading and unloading trucks more efficient through modifications to the tailgate, which will help Road Commission workers year-round. 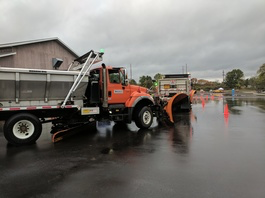 Events, like the Snowplow Roadeo, are a great way to demonstrate the hard work and innovation of Ottawa County Road Commission staff, as well as learn from other agencies. Preparing for Winter at 2017 Snowplow Roadeo! Drivers from Road Commissions and Public Works Departments from across the state practiced and competed in a snow plow driving course. 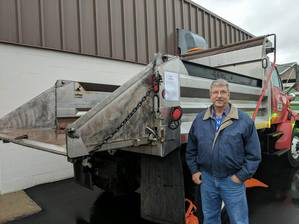 OCRC Equipment Supervisor, Randy Nagelkirk, stands next to the Road Commission’s winning entry for “Innovative Idea”. This entry was posted in Ottawa County on December 13, 2017 by editor.